Sometimes it seems as though the mainstream media reports superdelegates as though they were permanent votes. Or if they don't, they only mention superdelegates as a side bar or an asterisk when reporting, like an afterthought, in a quick sound bite, when no one is really listening. They post the superdelegate numbers on the TV screen in big bold type, to be sure that if someone is busy and can't watch the entire segment, they will see the graphic and just assume that Bernie Sanders has no chance at all of winning the Democratic primary. It's as though the media is routing for superdelegates, who are the "establishment" politicians. While superdelegates may be powerful votes, a pawn can still put a King in Checkmate. If Bernie Sanders wins enough popular votes, and the superdelegates vote against the majority will of the people, the Democratic party could implode — and his supporters might not even vote, giving Donald Trump or Ted Cruz the White House (Republican voters are already coming out in massive numbers.) Would spurned Bernie fans feel just as compelled to come out to vote for Hillary Clinton if she were nominated? Ain't no way! The superdelegates will have no choice but to back the prevailing candidate, or possibly lose their own precious niche within the party. Here' a graphic you'll never see on a cable TV news show (this was before Saturday's final election results). To defend the skewed delegate count in the Democratic primary, some pundits in the media are making the argument that it was the voters who are the ones who elected the superdelegates, and so therefore, by proxy, they have also agreed to support Hillary Clinton. This is a totally false argument, because many (if not most) of the current superdelegates were elected long before Bernie Sanders or Hillary Clinton had even announced their run for the Presidency. Bill Clinton is a superdelegate, and he was campaigning for his wife inside a polling location in Massachusetts. Bernie Sanders lost that State by a mere 1.48% (50.11% to 48.69%). Some people blame Senator Elizabeth Warren for not endorsing Sanders (Personally, with the low approval rating of Congress, I'm not sure any endorsement from a member of Congress or superdelegate is all that helpful). FiveThirtyEight reports: Superdelegates might not save Hillary Clinton, but they could tip the balance to her in a close race. If you’re a Sanders supporter, you might think this seems profoundly unfair. And you’d be right: It’s profoundly unfair. Superdelegates were created in part to give Democratic party elites the opportunity to put their finger on the scale and prevent nominations like those of George McGovern in 1972 or Jimmy Carter in 1976, which displeased party insiders. Here’s the consolation, however. Unlike elected delegates, superdelegates are NOT bound to any candidate, even on the first ballot. 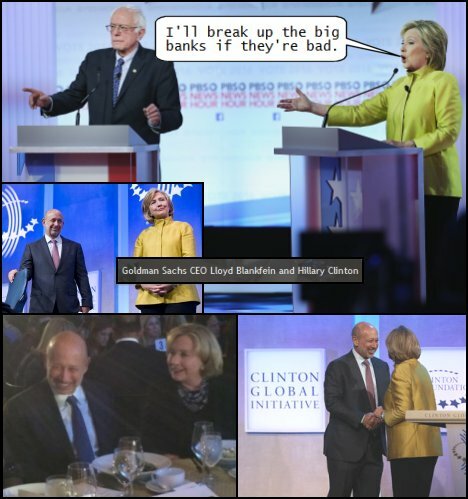 They can switch whenever they like [any time between now until the DNC convention held in late July]. And some of them probably will switch to Bernie Sanders if he extends his winning streak into more diverse states and eventually appears to have more of a mandate than Clinton among Democratic voters. Hillary Clinton knows this all too well; it’s exactly what happened to her in 2008 during her loss to Barack Obama. If you watch cable TV news (i.e. CNN, MSNBC, etc.) you'll see that they keep flashing these huge graphics on the screen showing Bernie Sanders lagging far behind in the delegate count with Hillary Clinton. There's a reason for this: The mainstream media is trying to kill the grassroots enthusiasm for Bernie Sanders, to make him look less "electable", and to sway voters to vote for Hillary Clinton. And what is that reason? Because Bernie Sanders would raise taxes on these very same corporations and their CEOs (and because the corporate media would prefer Clinton by far over Donald Trump). From my previous post: Is the Corporate Media Rigging Elections? >>> Media CEOs dominate the ranks of the highest paid executives. Six of the 10 highest-paid CEOs worked in the media industry. The six corporations that collectively control 90% of U.S. are AOL/Time Warner, Walt Disney, Viacom, Rupert Murdoch’s News Corp. (Fox News, etc. ), CBS Corporation and NBC Universal (owned by Comcast). As an example, Comcast owns MSNBC, and the VP of Comcast held a fundraiser for Hillary Clinton and donated to her campaign. And when the progressive MSNBC host Ed Schultz blasted Hillary Clinton for her support of the TPP trade deal, it ended up being his very last show on MSNBC. Quinky dink? The major media corporations support the TPP trade deal — the trade deal that President Obama wants. And Hillary Clinton is running on continuing Obama's policies. After supporting this trade deal 45 times, she has only recently said she against it (but that's only because Bernie has been steadfastly against it from the very beginning, as he's been against Bill Clinton's trade deals as well. It's almost guaranteed that Hillary Clinton will find some reason to support the TPP trade deal if she is ever elected President. Here is exactly what Hillary Clinton told Nevada political reporter Jon Ralston in a TV interview on June 16 last year about fast-track (TPA) and the program for re-training displaced workers (TAA) and the Asian trade agreement (TPP). Hillary Clinton only opposes the current TPP trade bill if it excludes the funding for re-training displaced workers. She clearly seems to support both the TPP trade deal and fast-track, and is only taking a stand on assistance for displaced workers — which, at best, is only a mediocre program that does very little for millions of workers who lose jobs to foreign low-wage countries or those who come here on guestworker visas. Despite the recent attention Bernie Sanders has been receiving in the mainstream media, it's not to benefit him. The cable news shows seem to find more pundits that are critical of him than who favor him, and many times don't provide equal time to Sanders' supporters. Just prior to Super Tuesday there was a media blackout of Bernie Sanders as thousands of his supporters marched in 45 cities. We didn't see this on Fox News, MSNBC or CNN. The mainstream media is not just reporting news, they are actively trying to influence the election to benefit themselves. If one watches very closely, the cable news networks sometimes do this in a very clever and nuanced way, such as complimenting Sanders for his honestly and authenticity, while also claiming that his ideas are too radical and not pragmatic. As for delegates: 458 of Hillary Clinton's "delegates" are actually superdelegates -- i.e., party insiders who support whoever they want. When you only count the number of "pledged delegates", Clinton and Bernie are running a fairly close race. 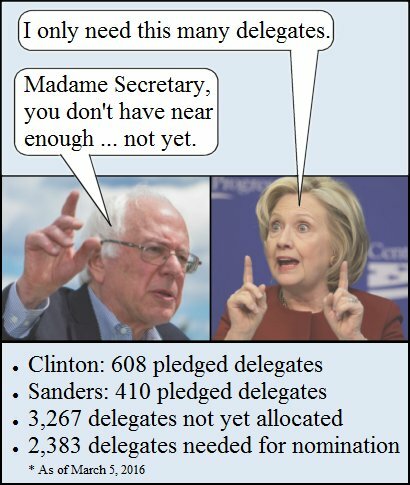 Clinton has 608 pledged delegates to Bernie's 410 — with 3,267 delegates not yet allocated — and 2,383 delegates are needed to win the Democratic nomination. Bloomberg (updated March 5, 2016) Hillary Clinton: 1,066 (includes 458 superdelegates) / Bernie Sanders: 432 (includes 22 superdelegates). 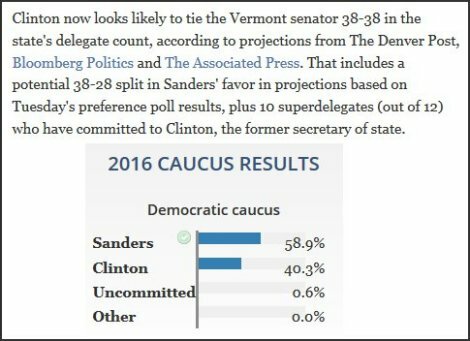 Below is a recent example for Colorado as reported by the Denver Post: Bernie won big, but because of "super-delegates", is only projected to tie Hillary in delegates because of the superdeleagtes. Also, besides over-emphasizing the super-delegate count, the media also keeps emphasizing that labor unions are backing Hillary Clinton: Not true. It's only the labor union's "leaders" who are endorsing Clinton. Whenever it's put to a vote to a union's rank-and-file members, the actual workers overwhelmingly support Bernie Sanders. That may be because of Bernie's stand on trade deals that offshore the best-paying jobs, or because of his stand on guestworker visas that use foreign labor to displace American workers for lower wages — trade deals and visas that Hillary Clinton mostly supports — i.e. NAFTA, PNTR for China (that her husband signed) — and until recently, the Triple Trade Treaty Threat: the TransPacific Partnership (TPP), which is expected to come to a Congress this fall. That will be followed by the TransAtlantic Trade and Investment Partnership (TTIP) and the Trade-in-Services Agreement (TiSA). Wow, didn't see that one coming. Congrats to all Bernie supporters. He is clearly highly competitive and if they swing it just to super delegates that will be disgusting now wouldn't it? But the media (especially on the cable news stations) are always totaling the delegate count with the super-delegates to make the election appear as though it's already a done deal for Hillary. To make it appear Hillary is the foregone conclusion, the inevitable nominee. They are still doing this, repeatedly saying Bernie has no chance or ignoring his wins and surges. They barely cover him in many cases. Establishment media is so useless, some very expensive talking noise that runs 24/7. Right now global recessions woes persist and fiscal policy has been obstructed by conservatives putting the burden on central bankers... who have run out ammo. The root cause is overproduction which led to outsourcing our manufacturing jobs and so unbalanced the global economy. There were props along the way but the main prop was socialist China's new city stimulus; and it has come to near standstill. So really, does its matter. While fiscal stimulus can create demand in the short term, in the long term the global economy is still unbalanced, and if not unchecked, will spin out of control. We need new ideas, and I don't see any out there. TPP & the other Global Corporate treaties/'arrangements'; Suing the Global Corporate Economy via ‘your’ government. TPP, et al, Just in Time to protect carcinogenic ‘Round Up’ & other Toxic products & Foods; the Future starts NOW. Taxes Cut as Gov’ts pass Lawsuit Costs to harmless citizens?